2017 Wisconsin Act 58. 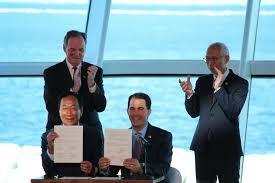 The Foxconn bill provides two important exceptions from Wisconsin environmental laws. First, the bill exempts the project from state laws that generally require a permit for wetlands disturbances. Under Wisconsin law, a permit applicant typically must demonstrate that the project cannot avoid or reduce wetland impacts, and that the project will not have significant adverse impacts on wetland functions and values. Foxconn will not have to make those showings; however, the company must create two acres of artificial wetlands for every one acre of existing wetlands that it disturbs. Federal wetlands regulations won’t apply, either, as the United States Army Corps of Engineers has already determined that the federal government has no jurisdiction over the wetlands slated to be disturbed because they do not qualify as “waters of the United States,” a fact-intensive determination grounded in the wetlands’ connectivity to traditional navigable waters. In a related section, the bill also exempts the Foxconn project from permitting requirements associated with placing structures such as bridges and culverts in navigable streams. Second, the bill exempts the project from the Wisconsin Environmental Policy Act, a procedural law requiring state agencies to consider the environmental impacts of major decisions. The bill creates Wis. Stat. § 238.396(5), which conclusively establishes (rather surprisingly, under the circumstances) that the project is not a “major action” for which an environmental evaluation is required under Wis. Stat. § 1.11. Developers often complain that WEPA and its federal equivalent, the National Environmental Policy Act, cause undue delays in project permitting and construction. Here, Hogan commented that “unnecessary delays were critical to [Foxconn’s] decision, and that “we were not going to get this opportunity if that was in the way.” Undertaking the analysis would have required DNR and other involved state agencies to consider environmental impacts of the project and consider alternatives such as different site layouts. Water use (quantity). The City of Racine will supply water to the Foxconn site through the Village of Mount Pleasant, which lies partly within and partly outside the Great Lakes basin. As a result, Racine had to submit an application for a diversion under the Great Lakes Compact. According to the application papers, Foxconn expects to use about 20 million gallons of water per day (MGD) in its manufacturing process and for cooling, but in-plant recycling will limit the amount Racine supplies from Lake Michigan to about 7 MGD. For comparison, this is slightly less than the amount the Compact Council recently approved for supply to the City of Waukesha (8.2 MGD). Between 1995 and 2015, water use in Racine fell by about 41% to 13 MGD, less than one-fourth of the water utility’s supply capacity, largely due to industrial departures and population decreases. Thus, supplying the Foxconn project would not even return the City to 1995 supply levels. Under the Compact, such diversions can only be made for “public water supply purposes,” which Wisconsin law implementing the Compact defines as “water distributed to the public through a physically connected system of treatment, storage, and distribution facilities serving a group of largely residential customers that may also serve industrial, commercial, and other institutional operators.” Project opponents have argued that the Foxconn diversion will not serve “largely residential customers.” Viewed from another angle, though, the Racine system as a whole likely passes the “public water supply purposes” test. If the test applied to individual uses of water, no manufacturer could pass it. No court has yet considered that language in a reported decision, and it would make for a novel test of the Compact. Because Mount Pleasant straddles the basin line, the approval decision will rest solely in the hands of the Wisconsin Department of Natural Resources (WDNR). The other Great Lakes states cannot veto WDNR’s decision as was the case with the Waukesha diversion, because (unlike Mount Pleasant) Waukesha is completely outside the basin, but within a straddling county. If WDNR approves the 7 MGD diversion, about 4.3 MGD (about 61%) is expected to return to Lake Michigan via the City of Racine’s wastewater treatment facility, while about 2.7 MGD (about 39%) will be consumed, primarily thorough evaporation from the plant’s cooling towers. Some of that water vapor may also return to the lake depending on wind patterns. On March 7, WDNR held a public hearing on the application, summarized here. The agency is accepting public comment on the application through tomorrow, March 21; submit comments here. Water quality. Much uncertainty remains over the details of Foxconn’s manufacturing process, the degree to which it will “pretreat” its wastewater before discharging it to the Racine collection system, and the ability of the Racine wastewater treatment facility to remove metals and other likely remnants of the manufacturing process that potentially could include zinc, cadmium, copper, chromium, and benzene. Racine has already pledged that it “would treat the return flow to meet all applicable permit standards.” Foxconn must also comply with state and federal standards applicable to storm water management and floodplain standards. The resolution of these questions will test Wisconsin’s ability to encourage economic development that relies on its water resources while maintaining its rich heritage of conservation and environmental protection. This tension will surely be discussed during an upcoming conference at the Lubar Center: Lake Michigan and the Chicago Megacity in the 21st Century, on April 17. A few seats remain: register here. Next Next post: Is it Time for More Than Just “Thoughts and Prayers”?